And If Our God Is For Us... is the sixth studio album by Chris Tomlin. It was released on November 16, 2010. It is also available as a CD/DVD Limited Edition featuring four acoustic tracks and a Behind the Scenes video. This album won the Best Contemporary Christian Music Album at 54th Grammy Awards. David Davidson: strings on "Our God"
Christy Nockels: background vocals, guest vocals on "Faithful" and "Where the Spirit of the Lord Is"
↑ "Christian Paradise review". Christianparadise.net. Retrieved 2011-10-26. ↑ "Jesus Freak Hideout review". Jesusfreakhideout.com. 2010-11-16. Retrieved 2011-10-26. ↑ Monger, James Review: And If Our God is For Us.... Allmusic. Retrieved on 2010-12-02. ↑ "And If Our God Is For Us... - Chris Tomlin, EMI CMG - Family Christian Stores". Familychristian.com. Retrieved 2011-10-26. ↑ "Chris Tomlin, "And If Our God Is For Us..." Review". Jesusfreakhideout.com. 2010-11-16. Retrieved 2011-10-26. 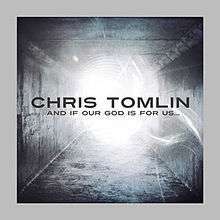 ↑ "News - Track Listing & Artwork For New Chris Tomlin Album 'And If Our God Is For Us' Revealed". Louder Than The Music. Retrieved 2011-10-26. ↑ "Year-end Billboard 200 (2011)". Billboard. Prometheus Global Media. 2011. Retrieved 9 December 2011. ↑ "Year-end Christian Albums (2011)". Billboard. Prometheus Global Media. 2011. Retrieved 9 December 2011. "Whom Shall I Fear [God of Angel Armies]"